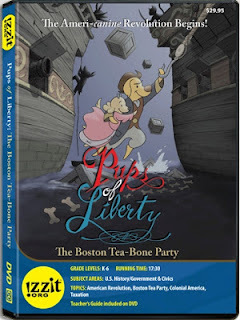 We've just released our newest DVD, Pups of Liberty: The Boston Tea-Bone Party. This is our first DVD specifically designed for grades K-6. It is an animated film which introduces students to the people, places, ideas, and events that led to the founding of the United States of America. The Boston Tea-Bone Party tells the story of the founding of the Sons of Liberty and the Boston Tea Party, but with the real people of history portrayed by cats and dogs. Along with this release, we've also created a new section for our website called izzitKIDS. Within this section are interactive features for students to learn more about the story and how the film was made. Check it out here. And don't forget to go order your copy of Pups of Liberty: The Boston Tea-Bone Party!